Tiny Farm is a free to play app animal farm simulation game published by Com2uS USA which offers in-app purchases. In Tiny Farm, you create a small farm with the cutest animals available, ranging from sheep, cows and pigs to even more ‘exotic’ animals such as dragons. You can breed the animals to unlock new colors, take care of your animals y giving love points and feeding them, earn money by planting seeds and harvesting crops and so forth. The graphics, honestly, are excellent. High quality and very colorful. Cute designs for the animals, visually appealing items and crops. 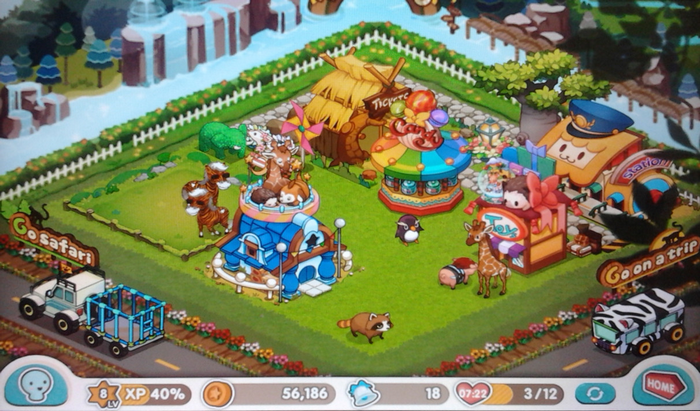 You will certainly enjoy looking at all the animals and decorations in this app. The available maps all have pleasant background music, although I really do prefer the background music of the farm. The beach, in my opinion, is a little loud compared to the rest. 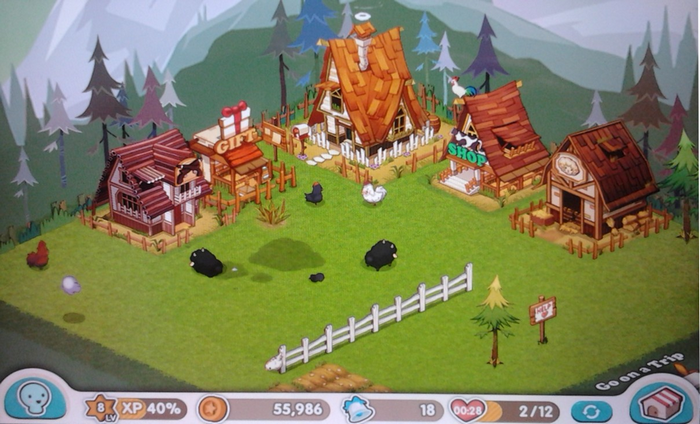 The Game The goal of Tiny Farm is build a prosperous farm with plenty of animals. You will be taking care of your animals by giving them love points, feeding them when they are hungry and by breeding them by unlocking new animals. Your personal goal, however, will most likely be to obtain your favorite animals, whether they are polar bears, llamas or tigers… or maybe you’ll want a Pegasus, blue dragon or zombie horse! Fact of the matter is, not all animals are as easily obtained. Some can be purchased with in-app money (coins), others will require the special currency (bells) or special items such as egg shells. Needless to say, the cooler the animal, the harder it is to get it. In the end, they will want you to spend your money on purchasing bells, of course. Making in-app money (coins) is fairly challenging; you will heavily rely on harvesting crops for this. So the best thing to do is to buy as many pieces of land as possible in order to start making money early on. As for making bells: not so easy! 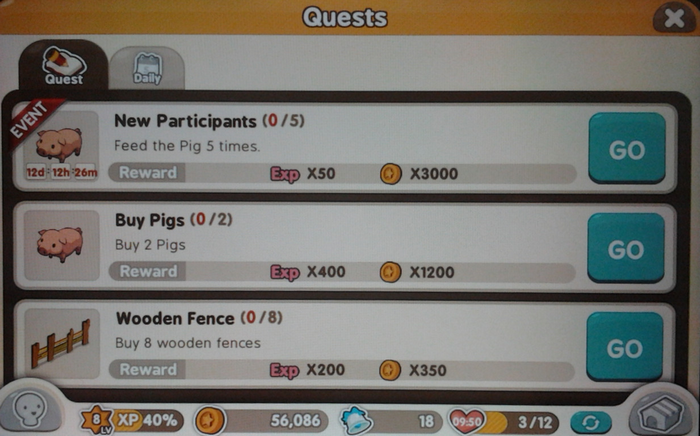 In fact, earning bells in Tiny Farm is plain hard. So from the moment you start your game, be cautious of accidentally spending bells and be sure to save up for as long as possible so you can really consider whether you are making the right purchase. Another thing I really like about Tiny Farm is the fact that they have frequent updates and events, which will draw me back to the game and give me new things to do. As I just said, making bells is hard. Luckily, the game provides you with warnings before accidentally spending your bells, except for the Safari Mini Game! If you don’t watch out, you can easily lose a bunch of bells while playing Safari. The game contains large updates, which take a fair amount of time to download. Getting Tiny Farm to run on a Samsung Galaxy Tab 2 was initially quite invasive; it seemed to freeze the tablet, forcing me to restart it, seeing as the game refused to operate while other applications were open. I know the tutorial is useful… but I personally found it quite lengthy. Bells are hard to get, so be sure to save them up and think about what you really want to get with them. In order to make in-app money (coins), you will want to harvest as many crops as possible. So be sure to buy land pieces to plant seeds on as soon as you can. Watch out; some seeds cost bells. Be sure to look for the best deals in terms of cost and profit. 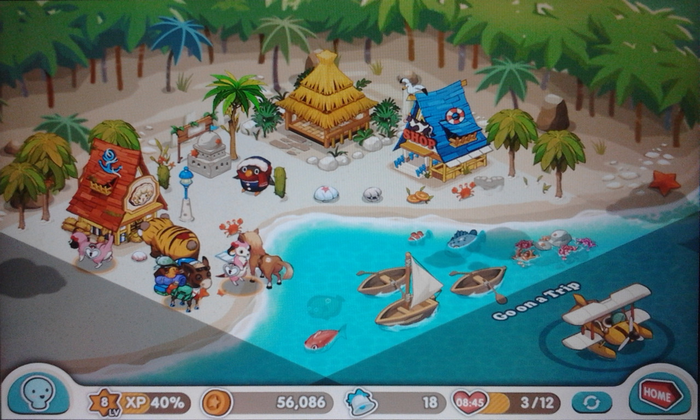 Buy the Beach (map) whenever you can; it will allow you to purchase fishing boats, which allow you to make money with. All in all, Tiny Farm is an app game that is heavily entertaining and provides you with many things to do, ranging from breeding animals, making your farm look pretty, collecting animals and playing mini-games and earning money. I would say it is highly unlikely that you’ll quit playing after just a day – there is so much more to this game! So as it is, Tiny Farm gets an 8 out of 10 for me.